My special event design site is primarily targeted to those looking to have custom designed printed materials for weddings, and that will also be the focus of this article, but please keep in mind that many of the services I offer are suitable for other kinds of events as well. These events can range from intimate get-togethers to corporate gatherings or any other kind of event you may be holding. The following is a display of pieces from a custom-designed suite that I created for couple (names changed for privacy) who wanted to use the colours black and silver, have a simple but elegant look, and wanted the majority of items to be printed using letterpress. 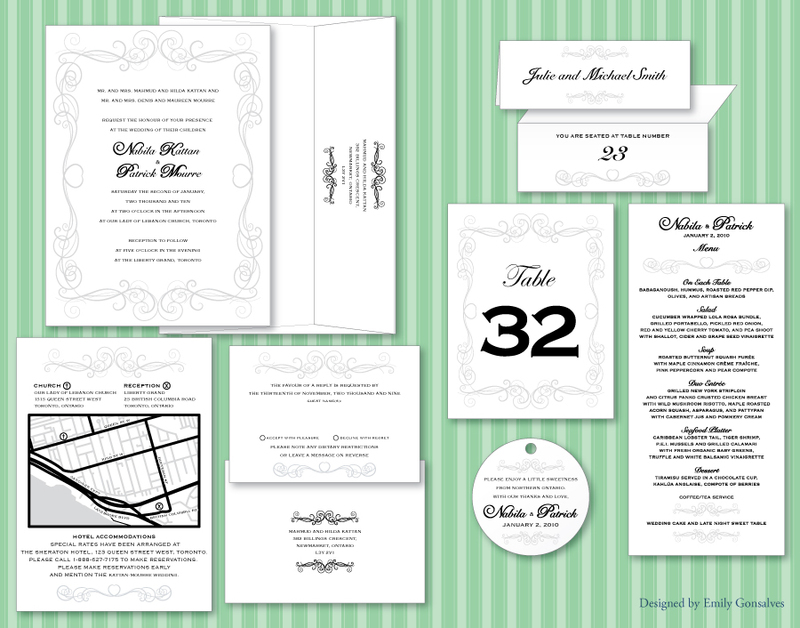 Select items were not printed with letterpress, such as the seating chart and card sign (not pictured), and items that used variable data (such as the table numbers). The place cards had the names and numbers hand written by a calligrapher, the remainder was printed using letterpress. All designs were vector based for the crispest quality and flexibility. Thank you card options were also designed, but not used. The heart swirl was something I created as stock art while working on the suite, but the other swirl was pre-created stock art by Room 122. The end result? The clients were very pleased with the way things looked in print, how the pieces were unique to them, and how the items added to their special day. If you have any ideas for other items that would be suitable for your event, just let me know. I can probably help you! I have experience designing a variety of items large and small for print and I also have experience designing websites, presentations, and other items viewed on screens. Also, don’t be afraid to ask about something that may fall out of my area of expertise. If I can’t do it for you, I will help you find someone who can do it right and stay true to the vision of the items I create for you. This article is primarily for those who want to have customized invitations and other collateral. Perhaps you are frustrated by the limitations of choosing from pre-created templates. Perhaps you want to know how you can get the beauty of letterpress without going over budget. Whatever the reason, I would love to help you realize your vision for your special day. For couples getting married, the budget is often a major concern. I understand how important it is for you to keep your budget reasonable and affordable. My services will not break the bank. My fees are generally $50 hourly for fully customized special event collateral. Communication fees are charged at $20 hourly and up; this includes email correspondence, phone calls, Skype meetings, and in-person meetings (the fee for the latter depends on my travel time to the meeting). Meetings are held on an as-needed or as practical basis. Now you’re probably wondering what it means to have the design charged at $50 hourly. Won’t that get expensive? How many hours will it take? Suppose you have 100 guests attending your wedding. You need, at a minimum, invitations, reply cards, and addressed envelopes for both. This is a total of 400 pieces. Now, if you go to a site providing template designs, you will be paying per invitation, per reply card, and the only envelopes included will be plain. You will have to pay extra to have printing on the envelopes, or you will have to hand write all addresses, even your own mailing address. Hand writing could be more time-consuming for you than it’s worth, but let’s focus on the cost of the invitations and reply cards first. Template invitations from other suppliers can range widely in price. They can be as low as less than fifty cents a piece (if ordering in bulk) or even $6.00 or more. Let’s say the template design you like costs $5 a piece. That makes your invitations alone cost $500. Even if this includes printing, you still have to consider that there are other pieces that cost extra! Now, say your reply cards are priced a little less, at $3 a piece. Your cost for reply cards will be $300. In total, you have already spent $800 and you only have plain envelopes. For a smaller wedding, this may mean cutting other printed items that match the set, handwriting the envelopes, or even considering making your own invitations. However, if you want to have memorable keepsakes, it’s a good idea to go to a professional. A correctly prepared design and quality printing will result in something that you can keep for many years to come. Something you print off at home on an inkjet printer though, will be subject to fading, discolouration, and other degradation. Also, care will be given by professionals to ensure that information is accurate and meets your standards. Now, let’s look at my pricing estimate for the design of the same items. For $300, I will design the invitations, reply cards, and do the repeated addresses for the envelopes (you may need a different option for the variable addresses on the invitation envelopes, but this depends on how they will be printed). While this assumes a somewhat simple design, it’s already obvious that the cost is lower and you are getting more for your money. But what about the printing costs? Letterpress printing is traditionally more expensive and requires a setup fee by the printer. Digital printing can be more cost effective. It’s also important to consider what your paper options will be. We can focus on printers willing to accept outside paper if you wish, or we can consult with the printer about their options. Quantities will come into play more when we are choosing a printer. For the design work, not as much. Although it is very helpful for me to know quantities so that files are prepared correctly, I don’t charge for custom design special event collateral based on the quantity. Rather, my fees are based on the amount of work involved for me to set things up for you. I am always happy to provide an estimate, but it is very important for me to know your budget and style preferences before starting work. Shipping costs may also be a factor for you. I encourage you to choose a printer who is close by so that you can save on shipping fees or even have the option to pick up items yourself to eliminate a shipping fee. Of course, I will always ask the printer about any costs that may be involved for printing and proofs, on your behalf. In comparison, if you like one of the templates available in my Zazzle shop, you can save even more there and pay less than $400 for invitations, reply cards, and printed envelopes – design and printing included, shipping extra. However, your customization options will be severely limited and the design will not be unique to you. Colour changes and font changes are not available through my Zazzle shop. If you really like one of my templates as a starting point (you can see them below), you can come to me directly for additional customization. If you are looking for custom-designed invitations that won’t break your budget, I hope this article has helped you put things in perspective. My services are quite cost-friendly and highly personalized in comparison to some studios who only offer templates and very little customization. If you would like to receive your own quotation for the design of items for your wedding or other special event, please don’t hesitate to contact me. In your message, please include: details about your event, style preferences, pieces you would need and numbers for each piece, timeline, as well as your budget. I am happy to discuss the options for you that can keep you in budget while giving you personalized, memorable keepsakes that add a finishing touch to your special day. If you prefer discussing things over the phone, just let me know a number and a good time to reach you and I will give you a call. I ask for e-mail as the initial point of contact as I will need to e-mail you regularly throughout the process, but you will receive a message from me very quickly with my additional contact information. If you want to know more specifically how I can help you, please get in touch. I look forward to hearing from you and letting you know how I can give you the personalized solution that is best for you. Thanks for this, Christmas that's always a time when you relax on savings and might risk spending a bit too much, so it's nice to see inspiring ideas for the festive season that won't totally break the bank!